Over Memorial Day weekend my friend Lauren and I decided we would go berry picking. Both Lauren and I have lived in Washington, DC for the past 8 years and have always lived in a city or right outside of a city so neither of us have spent much time on a farm. We thought we would take an adventure to the DC suburbs and check out an actual farm, Butler's Orchard located in Germantown, MD. 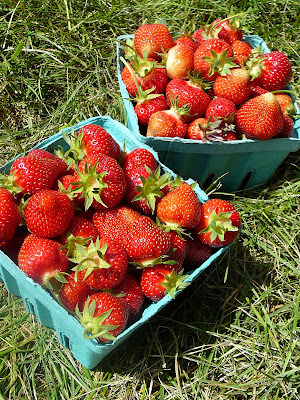 It was our plan to pick fresh strawberries, but before we made it to the fields we stopped in the farmhouse store. Lauren convinced me that we needed to get a cookie for "nourishment" while we were berry picking. Let's be honest....I did not need much convincing. 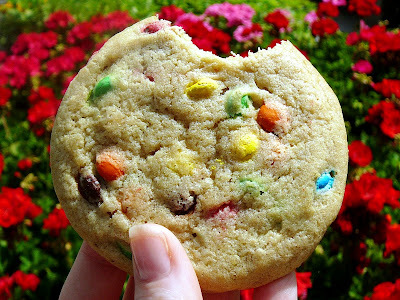 They had several cookies, which are baked fresh daily, but we decided on the M&M Cookies. I am so glad we got this cookie. I t was absolutely incredible! This may have been the chewiest cookie I have ever tasted. It was sweet and buttery and the texture was incredible. You could tell it had just been baked, likely by somebody's grandma. In addition to cookies, Butler's Orchard also offers a number of treats such as homemade jams, brownies, blondies, and gorgeous pies. Lauren and I really wanted to try one of the pies, but ended up not getting one out of fear that we would eat the entire thing! If you live in the DC area and would like to get out of town for a few hours I highly recommend visiting Butler's. We had a ton of fun berry picking and the cookie was amazing. I went for the berry picking but I am planning to go back for the baked goods. Here is a picture of the berries we picked.